This is an amusing arrangement. The Billy Balls are just plain fun...little balls of bright yellow. The scientific name for Billy Balls is Craspedia globosa. Other names for Billy Balls are: Billy Buttons, Drumsticks and Woolyheads. Which one is your favorite? The ball or 'glomerule' is made up of many tiny flowers. I love the look of the cotton also. 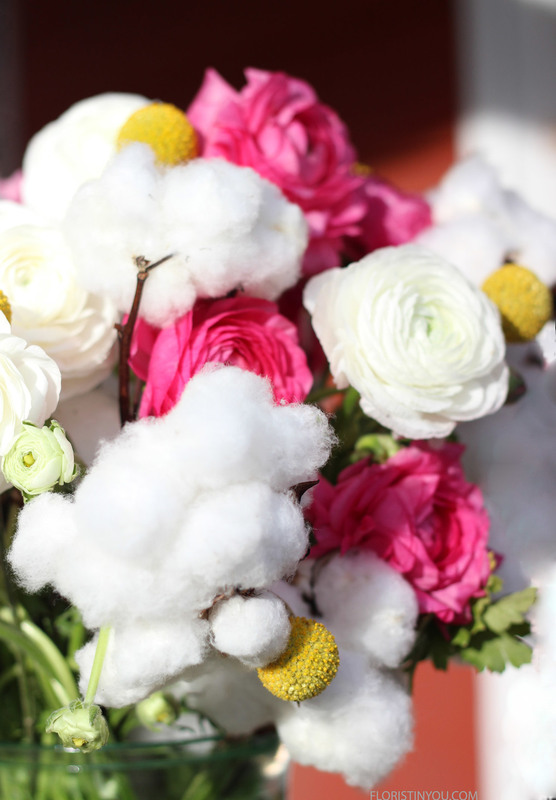 It looks like little clouds and the cotton balls are about the same size as the Ranunculus. 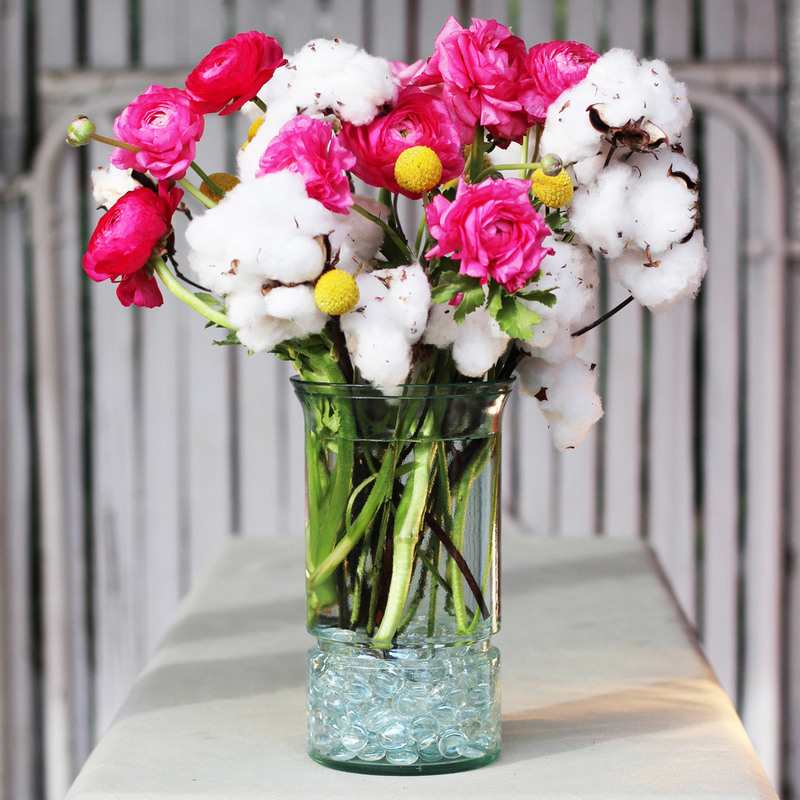 The pink Ranunculus add a color pop, and the white Ranunculus echo the cotton balls in color. 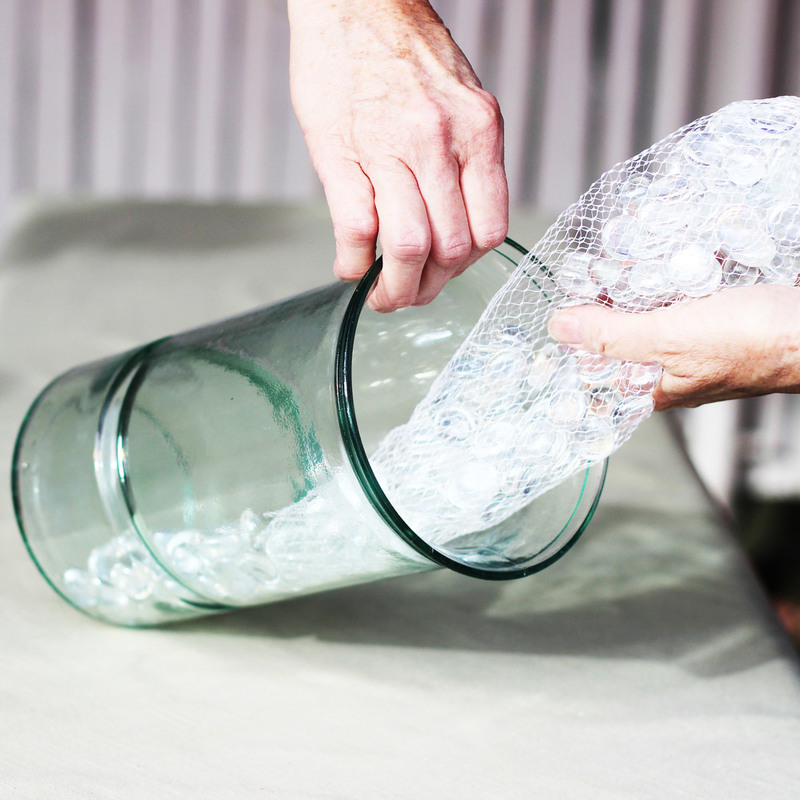 The recycled glass adds a translucent tone to the arrangement and the clear flat marbles at the bottom add some glamour. I will warn you though, working with the cotton is like reining in wild horses. The stems break easily and the puffy little balls stick to each other and everything else, like Velcro, and everything else sticks to them...e.g., dog hair, string, other flowers. There are little brown flakes that constantly fall from the plant and stick to the cotton the entire time you are working with it. TIP: At the end, you will have to 'clean it up' by snipping out the little bits of things stuck on it with a scissor. Don't try to pull things out of it. The whole cotton ball will want to come with it, and you don't want that, unless your short on your makeup supplies. If you do happen to pull the cotton out of the pod, not to worry, a little Elmer's glue will help you secure it again. OK. Now you've been warned about the 'sticky' cotton, let's go to work. This should be fun. Tilt vase on side and gently slide marbles in. Pour water in to about 2 inches from the top. Put stems in vase with two stems pointed outward at a 60 degree angle from the bottom. Put Billy Balls in so that they show. Add white Ranunculus and cut out things stuck in the cotton. The cotton puffs look like Cotton Candy. Add the buds with the Ranunculus. They have a wonderful look all their own. 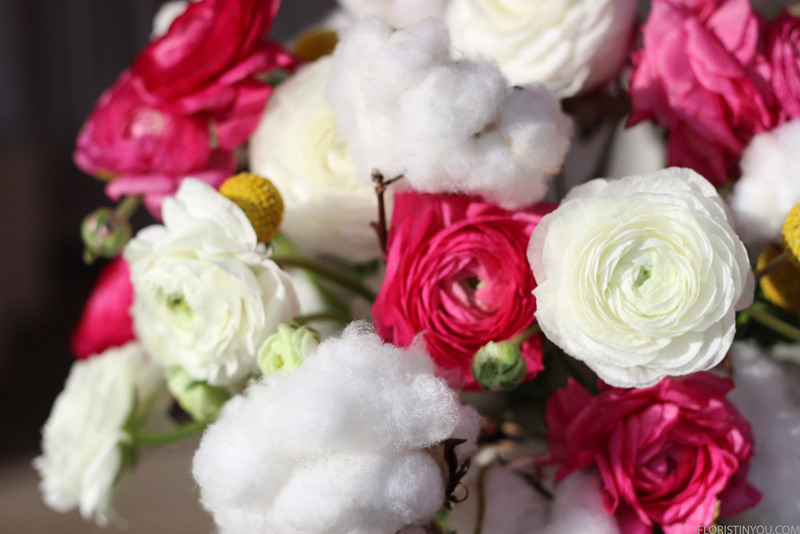 Really fun...cotton balls and Billy Balls and Ranunculus. You are finished. Enjoy this unique arrangement. PS. Everyone will want to touch the cotton.